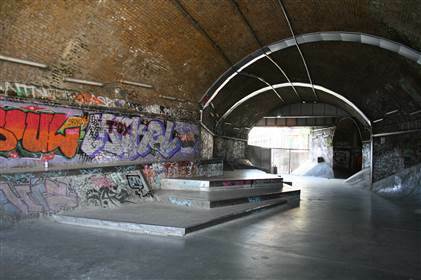 Whites Grounds is a skateboarding facility underneath a Bermondsey railway arch. This popular skatepark was specially designed by Southwark Council's frameworks and implementation team, the local community and investment partners. Together they all worked together to transform a run down railway arch in SE1 into an innovative new plaza style skate park. The skatepark can be booked for exclusive use. [TAGS: skate park/skate parks; skateparks; skating; arches; tunnels; graffiti; urban; inner city; street art; whites grounds; white's grounds]. If you would like to use this location for filming, please call us on the number below or email us at info@southwarkfilmoffice.co.uk.